Latin dictionaries define the name Fido as meaning “to trust, believe, confide in”. Books describing origins of names say that Fido means “I am faithful.” All apt descriptions of dogs. Abraham Lincoln, 16th President of the United States, esteemed for preserving the Union and ending slavery, was a pet lover as well. Lincoln often recovered from periods of depression by setting aside time to be with his cats and dogs. One special dog appeared on the scene and Lincoln promptly named him Fido. 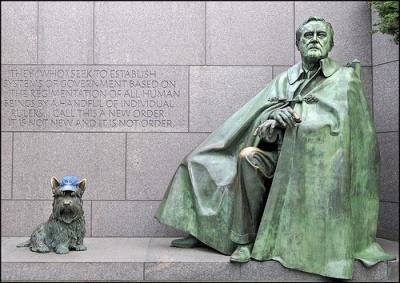 Fido was seen accompanying Lincoln wherever he went, waiting patiently outside when Lincoln entered an establishment. Mary Todd Lincoln, Abe’s wife, did not share his love of animals. When Lincoln won the Presidency, Mary Todd felt that it was unseemly to have a dog in the White House where he may annoy visitors and damage objects. Not wanting to argue, Lincoln complied and left Fido in the care of a local carpenter, John Eddy Roll and his family. 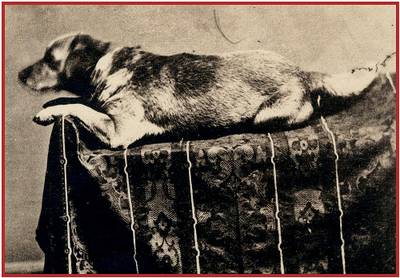 Lincoln’s love for Fido was shown by his instructions to Roll – Fido was to be allowed in the house, muddy paws or not whenever he wished; he was not to be scolded; he could be fed table bits at family mealtimes. Lincoln also gave the Rolls Fido’s favorite sofa to make him feel at home. Lincoln’s sons, Tad and Willy, were very sad at having to leave Fido behind. To help the boys cope, Lincoln took them along with Fido to a photography studio where he had a number of photos taken of Fido. But even when given a photo each of Fido, the boys remained unconvinced that this was a good substitute. Fido became the first Presidential dog to be photographed. Reproductions of some of Fido’s photos found their way into several newspapers where articles about the President and his dog appeared. Thanks to all the publicity, Fido became a very common name for dogs. After Lincoln’s assassination in 1865, hundreds of people from all over the country attended the funeral in Springfield, Illinois. John Roll attended, accompanied by Fido and it was reported that just touching the dog brought comfort to the grieving mourners. Sadly, a year later, Fido became a victim, like his beloved Lincoln, of assassination. Fido’s friendly and trusting nature led him to approach a drunkard who became frightened and stabbed him to death. But Fido leaves us with his name, a symbol of trust and loyalty.